No matter what holiday season it is, holidays and your GSD will add many special concerns to think about in advance. Whether it's the potential dangers of fireworks or Halloween candy, turkey or tinsel, or the added emotional stress of a busy holiday season on your German Shepherd, do your best to make sure your pets are safe and well! Below we'll list a few potentially dangerous holiday objects just as a reminder for things to be aware of this upcoming holiday season, to keep you informed and your German Shepherd healthy. Did you know that many holiday decorations can be hazardous to your pets? * The Christmas tree - If you have a live tree and add preservatives to your tree water and your German Shepherd drinks it then he could suffer from vomiting and diarrhea. * Tinsel and ribbon - If your GSD were to chew on these decorative ribbons the strands can ball up in the dogs GI tract, possibly requiring surgery. * Ornaments - These strange objects can be quite fascinating to your GSD. All the smells, shapes and odd textures. They're certainly not good in the mouth, or the stomach, of any curious pet. Additionally, twinkling lights are no good for chewing, and the whole tree could easily come down on a dog who bumps it or tugs on any of the low hanging ornaments. * Chocolate - Many have heard about the dangers of chocolate but do you know why it is dangerous to pets? It contains the chemical theobromine, which can lead to arrhythmia, tremors and seizures in your GSD. As little as 4-5 ounces can be toxic to dogs or cats. * Foreign-body ingestion - Cooked poultry bones are never a good idea no matter how much your GSD begs. These bones are highly prone to splintering, which in turn sends shards of bone through the German Shepherds intestines. One pierce in the intestinal lining can lead to deadly peritonitis. * Holiday plants - If your German Shepherd were to eat part of a poinsettia plant then he would probably get an upset tummy. 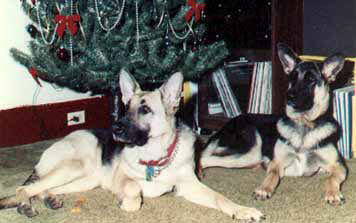 Mistletoe and holly are other holiday plants to keep your GSD away from. The berries and leaves of these plants are toxic and small amounts can cause depression in your pet. The bulbs of the amaryllis plant are poisonous as well, just so you'll know. * Food dangers - Anything that is very rich, fatty or spicy can potentially cause intestinal upset for your dog. It is possible that a fatty treat could trigger a serious inflammation of the pancreas or intestine which is potentially fatal. The final part related to holidays and your GSD, and probably one of the most important parts of preventive care, is knowing what to do in case of an emergency. Do you have a dog first aid kit? Do you know where to take your GSD when your regular veterinary hospital is closed for a holidays? Do you have those emergency veterinary care phone numbers? Take a few minutes now to make sure you have the numbers, just in case, and to post them in an easy to remember area to make holidays and your GSD as festive and safe as possible. This simple preventative step may well be the difference between your German Shepherd living and dying in the event of a holiday season related emergency.